Which board do I choose? Transgression USA is the official US distributor for Surfaces for Climbing (formerly JM Climbing Surfaces). We carry their innovative Transgression and Progression climbing training system. Surfaces for Climbing training boards were created after extensive scientific studies on how to efficiently build finger strength to improve climbing. We are proud to be the exclusive distributor for Surfaces for Climbing in the United States. For further information and reviews on our product, please visit our reviews & information page. 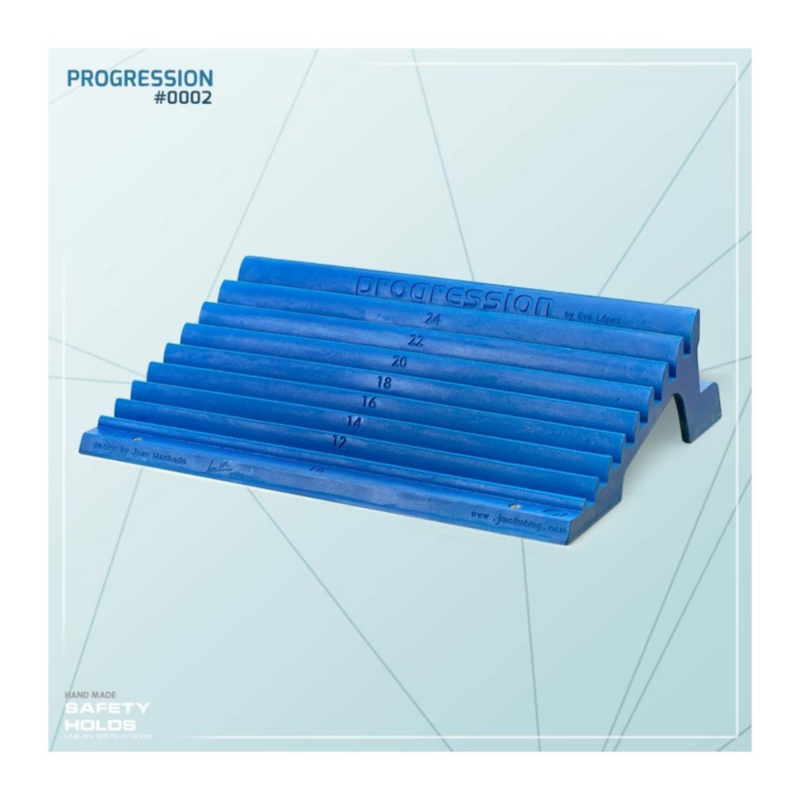 Progression®, created in 2011 by climber and coach Eva López, is currently the only finger training board that features both a design and a set of training methods derived from a Doctoral Thesis (López-Rivera, 2014). Scientific evidence about strength development, and the importance of individualization, specificity and progression of load were the starting points of Eva’s first studies in 2004, and they made apparent the need for a tool that allowed for changing the size of the edge where the training is carried out, and also to measure that different edge depths represented. Those studies (López-Rivera y González-Badillo, 2012) along with the first “Regletómetro” culminated with Progression and its companion Training Plan. There are no moving parts in Progression because it offers simultaneously 8 different edge depths to maximize convenience and load individualization in real time without wasting a single second, as required by modern training methods like endurance sets with very short pauses. Switching easily and quickly to a different-size hold is the difference between an effective, controlled workout and disorder or even overload. Progression is a big board for ergonomic and practical reasons. Our shoulder width varies and we know that placing our hand too close we can develop pain in our elbows (pronator teres muscle) and wrists, and in neck and shoulders if the grip is too wide. There is also enough width to blunt part of the edge with sandpaper for the open hand grip and leave the rest for the half-crimp grip. The Training Plan provides, along with methods and schedules, guidelines for warming up, correctly performing the dead-hangs, managing the load and prevent injuries. The contents are deep and thorough, aimed for users that are eager to learn and with a high capacity for effort. This Plan will allow them to become experts in their own process of improvement, boosting their motivation to seek out performance. Also included a Guide with installation and use recommendations. The Training Plan is available in English, Spanish, German, Italian, French and Slovak. These pioneering ideas seem to have some impact in the climbing world, inspiring others to follow the path we are opening. We hope that our approach based on the scientific method will promote future developments in climbing that lead to surpassing a product that, to this day, is still unmatched. - More than 16 years old (according to Morrison & Schöffl, 2007)*. - Lower level of finger strength (being able to hang for less than 10 seconds off a 10 mm edge). - More than two years of systematic and continuous practice of climbing. Edges: 10 mm, 12 mm, 14 mm, 16 mm, 18 mm, 20 mm, 22 mm and 24 mm. Maximum error in edge depth is ±0.3 mm to achieve a consistent experience across boards. López-Rivera, E., González-Badillo, J.J. The effects of two maximum grip strength training methods using the same effort duration and different edge depth on grip endurance in elite climbers. Sports Technology. 2012; 5 (3-4), 100-110. López-Rivera, E. (2014): Effects of Different Grip Strength and Endurance Training Methods on Sport Climbers of different levels (Phd Thesis). PhD program in Sport Performance. Castilla-La Mancha University, Toledo, Spain. * Morrison, A. B., & Schöffl, V. R. (2007). Physiological responses to rock climbing in young climbers. British journal of sports medicine, 41(12), 852-861. Transgression®, created in 2011 by climber and coach Eva López, is currently the only finger training board that features both a design and a set of training methods derived from a Doctoral Thesis (López-Rivera, 2014). Scientific evidence about strength development, and the importance of individualization, specificity and progression of load were the starting points of Eva’s first studies in 2004, and they made apparent the need for a tool that allowed for changing the size of the edge where the training is carried out, and also to measure that different edge depths represented. Those studies (López-Rivera y González-Badillo, 2012) along with the first “Regletómetro” culminated with TRANSGRESSION and its companion Training Plan. There are no moving parts in Transgression because it offers simultaneously 8 different edge depths to maximize convenience and load individualization in real time without wasting a single second, as required by modern training methods like endurance sets with very short pauses. Switching easily and quickly to a different-size hold is the difference between an effective, controlled workout and disorder or even overload. Why just edges? Because the load is not determined by the shape the hold, it rather depends on its depth and the total supported weight. We do not need to train a variety of holds but a variety of grip types. Half-crimp for smaller holds, open hand with 1, 2 or 3 fingers for one-, two- or three-finger pockets, or something in between like the open crimp, healthier and more versatile. Small-edge work can even help one of the skills that are needed to perform on slopers: the application of maximum force with our fingertips. Transgression is a big board for ergonomic and practical reasons. Our shoulder width varies and we know that placing our hand too close we can develop pain in our elbows (pronator teres muscle) and wrists, and in neck and shoulders if the grip is too wide. There is also enough width to blunt part of the edge with sandpaper for the open handgrip and leave the rest for the half-crimp grip. Also included is a Guide with installation and use recommendations. - You are familiar with specific finger training: unweighted dead hangs and moderate-intensity methods. - More than 18 year old (Morrison & Schöffl, 2007)*. - Medium/high level of finger strength (being able to hang for more than 15 seconds off a 10 mm edge). - More than 3-4 years of systematic and continuous practice of climbing. Edges: 6 mm, 7 mm, 8 mm, 9 mm, 10 mm, 12 mm, 14 mm and 18 mm. Maximum error in edge depth is ±0.3 mm to achieve a consistent experience across boards. López-Rivera, E. & González-Badillo, J.J. (2012). The effects of two maximum grip strength training methods using the same effort duration and different edge depth on grip endurance in elite climbers. Sports Technology. ; 5 (3-4), 100-110. López-Rivera, E (2014): Effects of Different Grip Strength and Endurance Training Methods on Sport Climbers of different levels (Phd Thesis). PhD program in Sport Performance. Castilla-La Mancha University, Toledo, Spain. *Morrison, A. B., & Schöffl, V. R. (2007). Physiological responses to rock climbing in young climbers. British journal of sports medicine, 41(12), 852-861.